She was at least eighty. She was dressed in a coat and scarf even though it was over seventy degrees and the sun was out and glorious. And she was ringing her bike bell at me because I was clogging the bike lane. I was trying to figure out where I was – as usual. I was squinting down at my I-phone which I have mounted to my handlebars at the GPS app. I was looking for those blue dots or purple lines that show designated bike lanes … I was trying to get myself out of the city on onto a loop ride west of Ferrara along the Po River. But I got moving when she belled me, and headed across the intersection hoping it was the right direction. After a week of navigating in and out of cities and point to point rides, I’ve got a good system. Bless whoever invented GPS – it (and this app I’m using) have made a huge difference getting me in and out of these cities safely. I am a reluctant adopter of new technology. My theory is that I don’t need to learn a new techie toy until I need to use it. My first attempt to navigate into a city using a paper map alone without using route-planning GPS had me doing an emergency U turn to avoid being sucked into a tunnel on the autostrada followed by multiple dead-ends trying to navigate around train lines. That motivated me to sufficiently to upgrade my technological expertise and master modern navigation. Ferrara is one of the most bike friendly cities I’ve ever visited. It’s one of the reasons I came – the more I read the more interested I became. Everyone here bikes. Young. Old. People going to work. People going shopping. People chatting. People flirting. Bikes are parked everywhere and line the allies and streets. They are a way of life here. I had never heard of the city of Ferrara before coming to Emilia-Romagna. 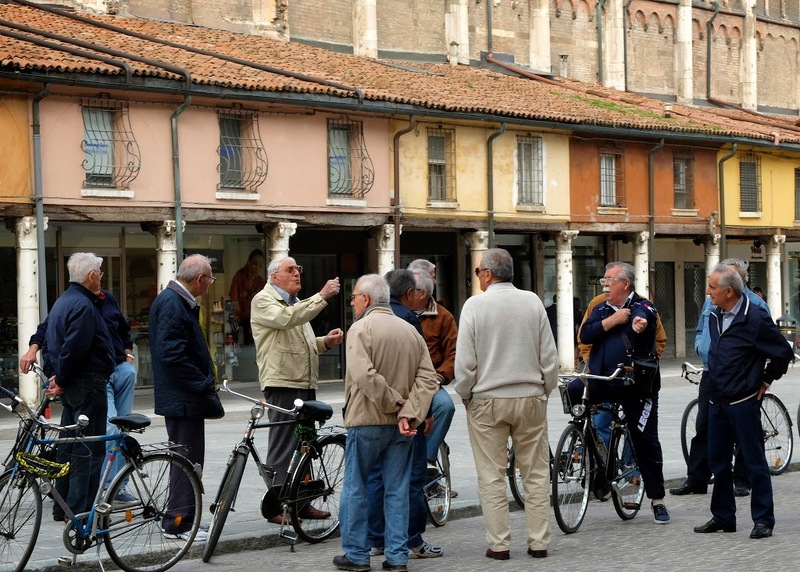 It is usually ignored by visitors who head on to Venice … and Ferrara’s fate has been to play second-fiddle through history to larger powers that surround it. But this city is terrific. And not just because of the biking. It was a true center of the Renaissance. It has a Palio. A huge central square. Rickety old medieval houses. Nine kilometers of mostly in-tact city walls. A pink and white marble duomo. And a medieval Jewish ghetto. All the trappings of great city of Renaissance Italy. Most importantly, it has a really great castle. Complete with a green-water slimy moat. A working drawbridge so you can actually see how it was engineered. A dank, stinky dungeon that requires you to duck down low to crawl through cell doors. And a legend of beheaded lovers – the Lord’s son slept with the Lord’s second wife and he beheaded them both in the dungeons at the young age of 20. I’m writing this sitting at Al Brindisi, the oldest Osteria in the world (according to Guinness World Records) which opened in 1435. I’m enjoying a glass of white wine from Bologna that was suggested by a very cute waiter – one of hundreds of waiters who has worked here over the centuries. He is watching all the girls stroll down this narrow alley by the duomo – like girls have strolled and waiters have watched for the last 600 years. I’m in good company at this Osteria. Titian drank here, as did a former Pope. And I’m sure the lady who chimed her bell at me earlier today has been here, and perhaps even the lovers who lost their heads met here for a tryst. It’s rare for a place to maintain its identity so purely. Here’s to hoping this city and the osteria stay unchanged for the next 600 years. Leigh, you can thank my father for GPS. He actually worked on the team that developed GPS. It was in coordination with the Air Force and yes, it was for the Strategic Defense Initiative (aka Star Wars). When I see how slow/fast I am riding/running I do think of him. I'd like you would think of him just for a moment too.